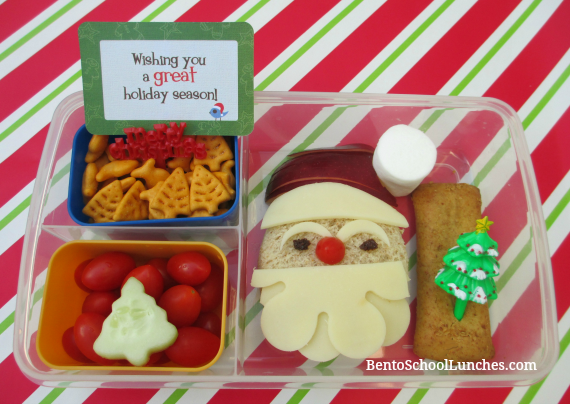 Today is the last day of school before the year end break and this will be my last Christmas themed bento before the holidays. I have several winter themed lunches and those will be posted next year in January when we get back. I have made a couple of Santa bentos previously, one of them with a strawberry hat. This time I used thin slices of apple instead, and a flower cutter to make the beard and eyebrows. I free hand cut the furry part of the hat from the same provolone cheese, used raisin bits for eyes and a cherry tomato for the red nose. The ball at the top of Santa's hat is a marshmallow. I would like to take this opportunity to wish all of you a very Merry Christmas and Happy Holidays! Main compartment: Santa sandwich, cereal bar with Christmas tree pick. Top left: Holiday themed cheddar crackers with a Merry Christmas cupcake pick. Bottom left: Grape tomatoes and a Christmas tree shaped cucumber. I love your santa...so creative! Thank you so much Ariani! So very cute! Merry Christmas and Happy holidays! Very cute santa! Happy new year! So clever with the flower cutter for the beard!